This text provides a fresh, accessible introduction to human metabolism that shows how the physiological actions of selected organs can be explained by their particular biochemical processes. Focusing on metabolic integration, rather than pathways, this book opens with three introductory chapters that explore the principles of metabolism and its control before moving onto ‘themed’ chapters that investigate liver, communication systems (endocrine and neurological), blood and vascular system, muscle and adipose tissue and renal biochemistry. 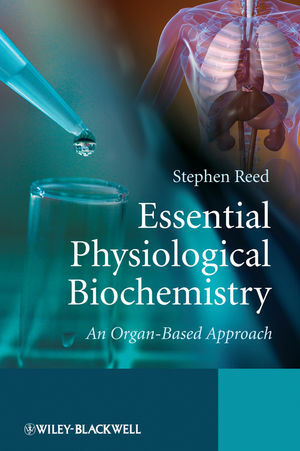 Targeted at non-biochemistry majors who need to get to grips with key biochemical concepts and ideas, this textbook is an essential guide for all undergraduate biomedical science, sports science, nutrition and other allied health students. A fresh, accessible primer that adopts a unique, organ-system based approach to human metabolism. Assumes only a basic understanding of chemistry. Chapters are arranged specifically to enable readers to grasp key concepts and to aid understanding. Some chapters include ‘Case Notes, illustrating key aspects of metabolism in cells, tissues and organs. Dr. Stephen Charles Reed, Department of Biomedical Sciences, University of Westminster, London, UK. 1.4 Enzymes and Enzyme-Mediated Reactions. 1.5 Bioenergetics: An Introduction to Biological Thermodynamics. 1.6 Enzyme-mediated Control of Metabolic Pathways. 1.7 Strategy for Learning the Details of a Pathway: ‘Active Learning’ is Essential. 2 Dynamic and Quantitative Aspects of Metabolism: Bioenergetics and Enzyme Kinetics. 2.2 Bioenergetics: The Application of Thermodynamic Principles to Biological Systems. 2.4 Energy Generating Metabolic Processes. 3 Principles of Metabolic Control: Enzymes, Substrates, Inhibitors and Genes. 3.3 Glycolysis and the K TCA Cycle as Models of Control of Metabolic Pathways. 4 Biochemistry of Intercellular Communication; Metabolic Integration and Coordination. 4.6 Target Tissue Response to Signals. 4.8 Diabetes Mellitus (Greek: Large Volumes of Sweet Fluid). 5 Biochemistry of the Blood and the Vascular System. 5.2 The Blood Vascular System. 5.4 Coagulation and Complement: Two of the Body’s Defence Mechanisms. 5.5 Blood as a Transport Medium. 6 Biochemistry of the Liver. 6.2 Physiology of the Liver. 6.4 Detoxification and Waste Disposal. 6.5 Maintenance of Blood Glucose Concentration. 7.3 Fuel Metabolism within Muscles. 7.4 Maintenance of ATP Availability in Active Muscle. 7.5 Fatty Acid as a Fuel in Muscle. 7.6 Proteins and Amino Acids as Fuels. 7.7 Fuel Utilization by Muscle: Adaptation to Exercise and Training. 8 Biochemistry of the Kidneys. 8.3 Metabolic Pathways in the Kidneys. 9 Biochemistry of Connective Tissue: Bone and Adipose. 9.2 Histology of Connective Tissue. 9.3 The ECM of Connective Tissue. 9.7 Adipose as an Endocrine Tissue. Chapters are arranged specifically to enable students to grasp key concepts and to aid understanding.